On 23 October (21 on birth certificate) 1940 a boy was born in Brazil. Parents João Ramos do Nascimento & Dona Celeste Arantes named him Edson Arantes do Nascimento. Through his liftime he received many different titles and names “The Black Pearl”, “The King of Football” and many more but we know him best as Pelé . I can fill pages of this blog yet I would not be able to cover all his marvels and acomplishments in life. Scoring 1281 goals in 1363 games, winning numerous medals, receiving multiple honours he made his way to be named the Athlete of the Century, elected by International Olympic Committee: 1999, FIFA Player of the Century : 2000, Greatest football player to have ever played the game, by Golden Foot: 2012, and many more. So I’ll just get to the point. The way pele left the game- an honor in itself. On 1 October 1977 Pelé’s father, his wife and a number of his friends including Muhammad Ali & Bobby Moore were present at Giants Stadium to witness Pelé close out his legendary career. The game was betweenthe New York Cosmos – who he had been playing with for two years, and Santos – the club where it all began, the club he played 17 seasons with, the club he joined when he was 15. The stadium was packed at full capacity and there were audiences glued to their television screens through out the world. Pelé gave a brief pre-match speech during which he asked the crowd to say the word “love” with him three times. He played the first half for the New York Cosmos and the second half for Santos. At halftime, Cosmos retired Pelé’s number 10 jersey. Pelé presented his Cosmos jersey to his father, who was escorted to the field by the Cosmos’ captain. 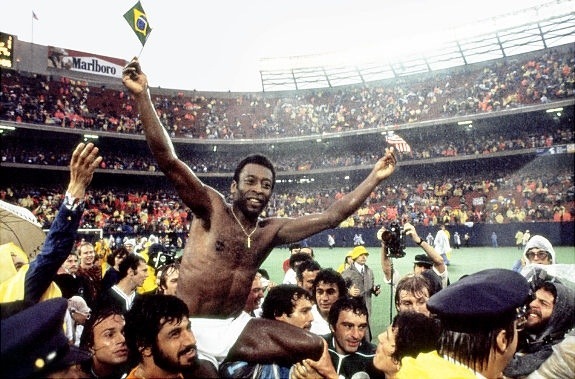 After the match, Pelé was embraced by the New York Cosmos players and then ran around the field holding an American flag in his left hand and a Brazilian flag in his right hand. What a finale to a fantastic career. Pelé final goal was against his former club. He scored on a direct free kick which the Santos goalkeeper was unable to contain. New York Cosmos won that match 2-1, but the audience got more out of it than just three goals.